PATHWAYS PROFESSIONAL COUNSELING HELPS INDIVIDUALS AND FAMILIES TO SEEK SOLUTIONS TO THEIR PROBLEMS THROUGH PROFESSIONAL, AFFORDABLE COUNSELING. 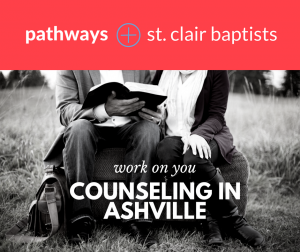 We are excited to announce our partnership with Pathways Counseling--a ministry of the Alabama Baptist Children's Home. A professional counselor will be available at the St. Clair Baptist Association Office in Ashville, Alabama to serve our area. To make appointments, call the Alabama Baptist Children's Home in Birmingham 866-991-6864 and ask for the Intake Coordinator for Morgan Roberts. Morgan Roberts is a Licensed Master Social Worker (LMSW) in the state of Alabama. She graduated with a Bachelor of Social Work from Auburn University as well as earned her Master of Social Work from The University of Alabama with a concentration in Adults and Their Families. Before joining Pathways Professional Counseling as a therapist, Morgan worked as a Girls Student Ministry Associate providing discipleship to 6– 12th-grade girls at a local church in Birmingham, Alabama, and worked as a Direct Care Counselor in the mental health field. Morgan enjoys working from a client-centered approach, providing strength-based care to children, adolescents, adults, couples and families. Morgan utilizes Cognitive-Behavioral Therapy, Person-Centered Therapy, Trauma-Focused Therapies, and Family Systems Therapies. Morgan desires to work alongside individuals and families as they process life’s most difficult circumstances, providing empathy, understanding and evidence-based care to help bring relief and healing in the lives of her clients. Morgan works with all ages, providing services in Birmingham, Oxford, and Ashville. Morgan and her husband, Eric, live in the Birmingham area where she loves being active, listening to podcasts, and a great pair of tennis shoes.